Getting clicks and zero conversions? Getting tons of social media engagement but not a lot of sales? In this SEMRush interview with host Rebekah Radice, social media experts, Mike Allton, Jeff Sieh, and yours truly share actionable tips for improving referral traffic, using social media to drive sales, and why sparking conversations can drive conversions. How do you get to the bottom of your traffic and conversion problem? Likes don’t always turn into leads and lots of traffic doesn’t always mean sales. To kick off the interview, Rebekah asked what businesses can do to attract the right traffic. To do that, Allton recommended creating a secondary dimension in Google Analytics where you can see what your Facebook traffic is doing on site. What did they do onsite? Which content did they consume? How much time did they spend on the site? When you take a look at your Google Analytics, you’ll have a sense of what your traffic is doing. To get a better understanding of what kind of activity is driving traffic, Allton also recommends using Google UTM parameters to drill down on how your social media activity is performing. For example, if you replaced the cover photo on your Facebook Business page with an announcement for your upcoming launch, Allton recommends adding a detailed description then adding a link to your landing page. Make sure to add UTM parameters to the end of your link and now you can see if traffic came to your site because of your cover photo. If you work with influencers, then using UTM parameters can also help identify which influencers are making an impact on your campaign. Jeff Sieh, who is the Social Media Marketing Manager for Social Media Examiner, mentioned that their team has a “UTM Librarian” that oversees all of their campaigns. Once you understand where your traffic is coming from, then you can see which social media initiatives are driving qualified traffic. How do you know if engagement from your live videos are driving sales? It’s all about the Facebook pixel and custom conversions. By tagging your links in videos, you can see which episodes are motivating the masses to take action. Did viewers know where to click? How many of those engagements actually led to traffic on the site? What are the absolute must-haves for a sales landing page? What if you still don’t get the sale? “If you got leads from a webinar and they didn’t take action, you can send a follow-up survey asking for feedback on why they didn’t check out,” I suggested. How do you map your products across the customer journey? Allton emphasized the important of understanding who your audience is, what they need, what their pain points are, and then tying a specific product or solution. For audiences that are comfortable with blogging and now want to launch a product, Allton now has the Campaign Planner that guides you step-by-step on how to craft the perfect campaign to generate massive buzz and sales. How do you track Instagram traffic? Sieh mentioned that accounts with a large following can take advantage of the Swipe Up feature in Instagram Stories and the bio link. For most small businesses, Sieh shared Jenn Herman’s tip which is to use a bit.ly link or Pretty URL that includes your UTM parameters. What other tips do you have for targeting your Instagram followers? Did you know that you can also retarget users that engage with your Instagram profile? All you have to do is create a custom audience in Facebook Ads manager of people that have engaged with your profile. Any tips on how audiences can repurpose their content across social? Allton, Sieh, and I had a ton of recommendations to share with the SEMRush audience. A new tool has just launched called Designrr - that will take any web page, video, or podcast and turn it into a beautiful lead magnet - no graphic artist necessary. P.S. If you need additional transcription hours, you can easily add 2, 6, or 15 more hours to your plan. I signed up for the Premium Plan which gives me four hours of transcription plus unlimited lead magnets! Imagine being able to transform your blog posts, videos, or podcasts into ebooks. Since Ecamm already saves my live video into Dropbox, I connect it to Designrr and within minutes, I already have an SRT file and transcript that can be converted into a blog post or ebook. Get more visibility for your Facebook Live or regular Facebook videos by automatically uploading them to YouTube giving you massive exposure after they fade from the Facebook newsfeed. Eliminate the hassle of downloading videos from Facebook and uploading to YouTube while saving a ton of time, Internet bandwidth, and computer resources. Now that you have all this amazing content that you’ve created, it’s time to set your content calendar on auto-pilot! I use the publishing queue on Agorapulse to consistently promote my blog posts, episodes, guest interviews, and so on! Loved what you’ve read so far? Watch the replay above or click below for the transcript. Rebekah Radice: And we're live well. Hello and welcome to the first installment of sem rush social chat. Two point. Oh, I am your host, Rebecca And today we are talking about your social traffic and why it's not turning those lookie Loos into leads, traffic and sales. And I am joined by our illustrious panel of experts. I'm going to kick it off with a Stephanie Loo. Stephanie, this is our first time together online video. I am so excited. First Time hanging out and we're already color coordinating. This is. How will we made that happen I don't know, but welcome. So excited to have you here. Thank you. Yeah, this is amazing. I'm like so ready for this. I loved our pre chat. You guys are in for a wild ride. We've got plenty of stories to tell you. Yes. So Stephanie, you are the CEO of lights. Camera. Did I get that right? Stephanie Liu: Lights, camera, live, yeah, you got it right. Rebekah Radice: Thank you. Yes. So you are our live expert obviously also running your own business. Uh, so definitely an expert on today's topic and I look forward to so many of the stories we were just chatting about. I think our audience is going to have a lot to take away from your experience and what you're working on right now. Yeah, I think it's going to be really great. So thanks for having you on the show. Absolutely. Mike Alton is also here with us. Mike is the founder of the blogging brute. Mike, how you doing Thanks for having me. I am really, really excited for today's Webinar. Very excited to have you here. And Jeff see also in the house. How are you jeff I'm doing great. Thank you for having me. I appreciate the ask. Yes, yes indeed. So Jeff is the owner and creative director at his design and on the social team at social media examiner. And I should also say that, uh, Mike joins us from a gorup pulse as well. So I love that we've got a the mix of entrepreneur business owner as well as that big brand, the experience that I think we're going to get a very nice mix of ideas as to how to get that social traffic to actually refer. Rebekah Radice: So you guys ready Ready Yeah. All right. So as I said, today is a panel of experts, but we're going to be super interactive. If you have questions, if you have feedback, if you'd like to ask a question of anyone specific on this panel, just drop that down into the. We will be actively monitoring that and make sure that we get to all of those through out. So I want to start with the big myth. I think one of the biggest myths is that more traffic equals more conversions, but of course we know that that's not always the case. You know when conversions are lacking and we're looking and we're trying to figure out what's going on because our social interaction is high, where do you begin and how do you get to the bottom of what's really going on with your traffic and conversion problem. Mike, let's say, let's start with you. Mike Allton: You're right, it is a bit of a myth because all traffic is not equal, all traffic's not the same. It's not all coming from the same place. When we go into our google analytics, we can see the traffic coming in from facebook, from twitter, from Google, search, from other websites, and just because we're getting more traffic doesn't mean it's coming in from those exact same places. But to your point then we need to figure out why isn't converting or what's converting and what isn't. And I mentioned facebook, so let's imagine for a moment that you got 100 visitors from facebook last month, some of them converted, most of them didn't, and we want to drill down and figure out why. Well, you can go into Google analytics and you can add what's called a secondary dimension and you can see from all that traffic from facebook, what did they do, what content did they go to, and you can kind of get a sense then of what's going on. Mike Allton: You know, how they're converting and on what piece of content, but that still doesn't. The answer, the question of where did they come from, because facebook's a big place. They could have hit the call to action button on your page. They could have been clicking on your posts, but they could have been clicking on somebody else's shares of your content. So the one tip that I want to put in here is that we want to look at that referral traffic and we want to try to understand where it's coming from within the facebook ecosystem. So I want to suggest that you use Google utm parameters. You put campaign tags and source tags and content tags on your call to action button on your cover photo. If you're inserting a link there in the description and certainly on the posts that you're sharing to your facebook page. Rebekah Radice: And this is also true for every other social network by the web. So you put those campaign tags in those content tags, utm parameters on those links. So then you can go into Google analytics and you can see where the traffic's coming from and that's going to help you understand, oh, okay. We did these posts last month and we generated this much traffic, but it was only these three posts out of the whole mix of posts that actually converted and so that tells you that's the content. Those are the posts that are actually going to drive conversions, not those other ones. Maybe there's a purpose for those other posts, but they're not converting. Mike Allton: Right. That's absolutely, and I'll be honest, this is something I don't do all the time, but when I have a major sales campaign going on or a major initiative going on, I'll be sure to add those tags. That way I know posted my profile post to my page posted groups post to that influencers are doing or affiliates or whatever the case might be. I can see what's happening with that content and whether or not they're performing the way I want them to. Jeff Sieh: Yeah. I want to bring up one of the things that we do and I want to piggyback on what Mike is saying, the importance of those tracking codes, those utm parameters. They. It sounds really nerdy and Geeky and hard to do, but they even have a tool where you can just drag your links in. It will fill it out for you. What we do at social media examiner as I'm on the social team, is that we have an entire utm library, a huge Google doc where we track everything, so it's we're putting out content so much every day. We really want to know where it's coming from and what, you know, platform's performing the well and if ads are working and all that stuff, and we have a utm librarian and her job is to actually create these utm codes for each in it's broken down from each channel and that whoever's in charge of posting that stuff, uh, on like pinterest or say instagram and we have the right links that we use in. It's broken down for us. So, uh, you can, you don't have to be that nerdy and that Geeky, but just having a simple google doc where you can take your, your, your links that you're doing, drop them in that, you know, utm creator that Google has for you and then pasting it there and having a record of that so you can just kind of get yourself in the habit of doing that. Jeff Sieh: So the editorial kind of arm of the company so that they take care of the utm library and are, like I said, the utm librarian does all that. So I've learned this for using from my own clients is my process is you know, usually I have a doc if I'm putting together at pinterest campaign for somebody because you really want to track, you know, because pinterest has so much longterm traffic, you want to make sure that you're putting the right stuff and you know, you're, you're getting the value you're putting into it. So I just usually take the blog post article and have a, you know, the date of when I posted it, put that in there and then do that, that you have the tag tool that Google has, drop it in there, put in the campaign name and it's usually I just tell it from pinterest and then paste that in there as well. And I do that for any other networks I'm managing. It's written. Once you get it down the process down, it's really simple that you just need to have a one spot where you're storing it for your. I have a tabs for all my clients and it's on Google docs so I can get it added anywhere, like if I'm out on vacation I need to access it in the cloud. So that's kind of what I've learned from social media examiner and applied it to my own clients. Rebekah Radice: Yeah. Well, and, and to your point, you're really running blind. Hey, if, if you're not paying attention and it can seem a little geeky or overwhelming, but there are so many different tools, including, you know, Google making it just super simple to be able to get that information and then make decisions based off of what that editorial team or you are looking at. And you know, Stephanie, I, I, I know we talked about you use a lot of live videos so I would imagine this is a incredibly important to you as well. But do you have any other tips outside of what we heard already here on how to track that Yeah. Okay. Small. Stephanie Liu: So here's what we usually do for, for my team as well as my clients, is that when we have our editorial calendar, we're a little old school. We actually still work off of a Google spreadsheet and then we have a tab that's actually called the utm builder and what we do is actually we have the um, the calculations, we concatenate it, so it says what's the campaign name of, what's the term, the keyword in the url and that way whenever they're developing copy that's promoting a landing page or anything that they're putting out there and you can just flip over to the tab, plop in the url and it automatically build it for them so that way they don't have to worry about opening up another window, browse around all that stuff. Mike Allton: Yeah, absolutely. Because it's easy to get enamored with what we sometimes call the vanity metrics, right Numbers of followers, but also engagement likes and shares and stuff on specific posts. Even if those posts aren't actually driving business results. So if you're with us so far, we've looked at, we've taken a look at our analytics and we've tried to use utm campaign parameters and that sort of thing to determine which posts are actually driving those business results because then we can have that in mind when we're creating the content on various social networks and we're looking at the performance of specific posts. We know a particular post should potentially drive business results and we may know that another post might not drive sales, but it might drive engagement and it might drive subscribes and those kinds of, you know, top of funnel activities which are still good. Those are good for brand awareness and those kinds of activities. So that's the real key at this point is coming to that understanding that we don't want to just look at those vanity metrics. We don't want to just look at the engagement, we want to have a business reason for wanting those kinds of things. Rebekah Radice: Well, and, and to your point, it definitely depends on what your goals are as far as why are you on social media, why are you using any of those particular social and what are you looking to accomplish Jeff, talk a little bit about that with each different social channel. When you sit down with a customer or a client and they say to you, I'm not really sure, you know what I'm looking to achieve So for that person it's going to be very difficult for you to figure out what exactly is unqualified social traffic, how do you get help them get from that muddy area into a place where they, they understand what they're trying to do with all of those different channels. Jeff Sieh: You know, that's a tough, that's a tough thing when you're dealing with clients because a lot of times they don't know what they want or you know, until you have to educate them. And so I kind of piggyback on what Mike said. It's, you know, it's the data and the unqualified traffic. You know, you want to look at whatever channel. 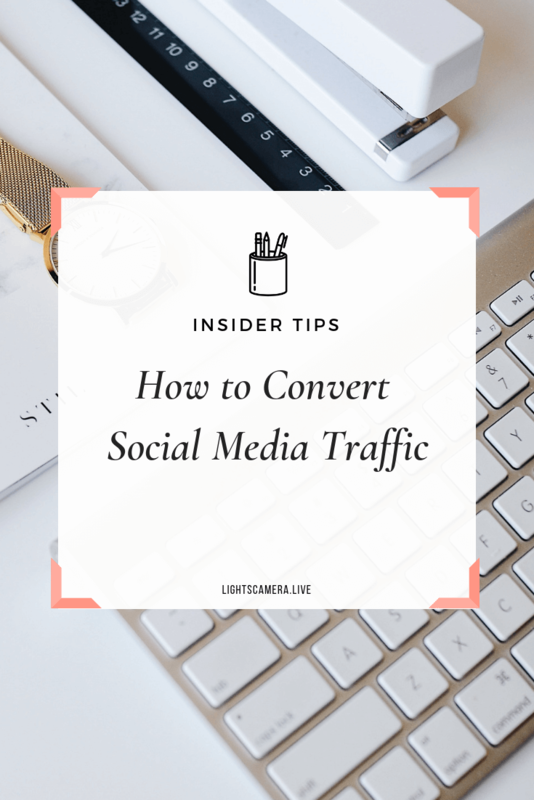 Like if, let's say you are driving traffic from pinterest to your site and it's, you're getting traffic but you're not getting conversions and so you see your bounce rates really high, they're not staying on your page. Well why is that And so we're, you know, all of us here and if you're a marketer, you're having to deal with visuals, visual marketing and I know we've all talked about this and it's lot of times you're shocked of what image works and you have an idea in your head, well this is a real pretty one. Jeff Sieh: This is going to really convert really well and all of a sudden these horrible, ugly images are converting and you're like, why are they doing that And what Mike was saying is like, you know, drilling down and trying to understand the path through your site, why they may be that unqualified traffic is bouncing so fast and you know, like here's just a real world example is, you know, this was, I had a great pin. It was driving traffic but it wasn't converting and they were bouncing really high. And I was like, why is this not working Because it's, it's getting the traffic, it's, you know, it's, it's getting there and to come to find out it was the image on the actual pin was a disconnect from the actual blog article or the, the uh, landing page that we were driving to. And so people would go to it and they saw a different image that was on the pen and they were like, oh, this must, I must have hit spam or it's not right because they don't want to read. Jeff Sieh: And so that's, you know, that's what you have to really drill down and try to think of like why are they bouncing like this Why is this unqualified traffic not working and doing a little digging and going and changing stuff on the fly because I know we've all been there where like this, this is great content. It's so good that everyone should love it. And then they don't. And you're like, I thought it was good. All right. She should have got more traffic in and trying to step away and not be emotional about it, but look at the data and then move forward from that. Rebekah Radice: Well, and, and I hear what if, what I hear you saying is don't just look at the data, but more importantly, really dig into it because from a surface level you can have an assumption, you can have a gut feeling of what might be going on, but if you hadn't done your due diligence, you never would have gotten to the bottom of that and actually figured out that, hey, there's a disconnect and that is exactly what's creating that balance. So sometimes it takes a little bit more work than we initially think. So Stephanie, you talked about content upgrades and offers and I'd like to move to the flip side of unqualified social traffic. So to those people that are saying, okay, you know, Stephanie, I've put together an amazing product and amazing offer. Um, I'm driving qualified traffic over to my offers by landing pages, but I cannot get them to pull the trigger on that purchase. What are your suggestions? Stephanie Liu: I mean, at that point it's, it's a good time for you to go ahead and start split testing your landing pages, right So someone who's probably just seemed like one video that you've ever done might not have that know, like and trust factor, so your landing page is going to be really important to say, this is what this program is about, this is what this service is about, this is what other people said. There's certain elements that can really enhance your landing page to drive that conversion. Whereas there's probably other people who know, like and trust you already have watched all your videos, subscribe to your shows, your emails, all of that good stuff. Then when they hit your landing page, they just want the button that says skip to purchase now. Right But if you bury it all the way at the bottom, like, man, something happens, right? Because when you're on social media, you get a twitter notification, someone tags you on Instagram, you get distracted, so you think are really, you know, for the unqualified traffic. Think about different ways that you could split test your landing pages, whether you're using something like lead pages or click funnels and see what's really working from there. Another thing that I would recommend is if you have people that had hit your sales page, right Like so I just had a program that launch. Some people hit the sales page, but they didn't pull the trigger. There's something else that you could do because if they signed it for a Webinar, you could send them an email or even a survey. It says, Hey, Rebecca, I saw that you were still interested in this program. For what reason can you tell me because I love feedback. Why didn't you complete the purchase Was it because something was missing Did you need more testimonials and get into that mindset because once I hear in your own words what you're thinking, what you're feeling, what your hesitations are, the next launch that I have, I could go ahead and put that into my Faq and make you feel much more comfortable in investing in yourself. Yeah, great point. I'm just really understanding the language they're using, the words that they're using so that you can have that commonality and as they come to your landing page or wherever that might be, if they do, they just, they naturally feel like, oh my gosh, she gets me, she knows exactly what I need and here she is. Now, I would also imagine when we talk about elements that your love of, uh, it's probably very high on the list of ways to get to that know, like, and trust as quickly as possible. Rebekah Radice: Are you using a lot of video on your landing pages? Stephanie Liu: For the very first one Yes. Yeah, so when we had the program, the first one was like a one minute video that says this is how facebook is changing the landscape of social media. This is what live video can do for you and your business. And then at that point it's like, cool, I'm in skip, skip, skip to see what's inside the master manner, what's inside the program or further along the page. That's where you start to get that social proof. You get like your best testimonial that takes them away from their first objection. If, let's see, for live video, I'm scared of being, uh, being on camera. You get your best testimonial from your shyest member and he goes, Oh my God, I'm officially launching my show. And when they see that, they start seeing is believing. Right So at that point it gets them further down the page to go ahead and make that purchase. Yeah, absolutely. And in somebody just asked, a William asked if you would be willing to share your google sheet template sample. I'm the one obviously you just talked about with the UTM parameters. Oh my gosh. For You William Yes, of course. We are a giving group here. Mike Allton: How to amplify your blog and get, you know, thousands and thousands of years. Then I went into the analytics and I saw that most of the people coming into my site, and this is still true today, they were coming there to find specific answers to specific facebook questions, how to link to a facebook post, how to tag somebody on facebook because this is content that I've written before and that was driving 75 percent of my traffic. So there was a disconnect between the offer I was giving them and the reason they were there to begin with, they weren't at that point in their journey. They're just learning about social media. They might never need a piece of content that's all about how to promote blog posts. So I created something new, I recruited the facebook survival kit, now I get hundreds of subscribers all the time to that particular piece of content because there is a match now between where they're at and what they're looking for in what I'm offering them. Mike Allton: Right They're looking for answers on how to use facebook, how to get better at facebook, and I'm offering something even more than that. I mean obviously they get the answer to their question, but now they also get that extra bonus piece of information. So that's where I'm at with the blogging content and I think everybody can benefit from taking the time to think this through. Who were you trying to reach What do they need What are their pain points, what are their challenges And do you have a product that solves that or do you have multiple products in one or two of them Solve that because you want to make sure then that the content that you're creating, whether it's video, audio or written, solves and talks to the problems that your products fit in. So you, like you mentioned a planner. Well I've got a couple, but the one that I just launched is how to start a blog. Mike Allton: So I'm not targeting you, Rebecca, would that particular player. It's not going to help you. You are well on your way towards, you know, having that awesome successful blog. I'm targeting the people who haven't started yet or maybe they've been blogging for six months and they're spinning their wheels, right They haven't gotten the traction. So it's a particular type of person that I'm targeting and I understand that out of all the content that I've created, there's only a subset that's talking to people who are at that point in their journey. They're just starting. And so that's designed to help them. Rebekah Radice: So we've, we've talked about how to track at a really digest and understand all of that data, uh, and how to get to the bottom of what your audience is coming to you for. Um, and then you just talked about the variety of different pieces of content and how to really map that to where they're at, not only within their journey with you but where they're at within their business because you're talking about people that if they're, they've been blogging for a of years, they're going to want a little bit more advanced type of information and you've got to be prepared for that is what I hear you saying. Making sure, again, and I think this goes back to what Stephanie was talking about, making sure you clearly understand the needs of your audience and why they're seeking you out. Mike Allton: Yeah, and if I could just interject a little bit of a technical tip here. What we're talking about is it sounds very abstract, right I've got an audience which is just this nebulous thing over here and they're coming to the site and they're looking at this stuff. Well, let's get technical for a moment, right You've got traffic or you're trying to get traffic. Maybe even you're paying for traffic and you're driving it to specific pieces of content. When you do that, that's your opportunity to talk to that audience specifically. You can use popups. You can use links within the context of the content and you can use sidebar calls to action. You can design the experience around the visit to each specific piece of content to suit the audience that you think is most likely to be reading that content. My basic facebook, how to types of posts. I know who I'm talking to with that content. I'm not talking to season social media professionals. I'm talking to everyday people who want to know something about facebook and so I can offer them something and I can say something inside that post that speaks to them. It helps them and maybe sells them on something. Rebekah Radice: Yeah. Well, and, and Jeff, you, uh, being the host of the manly pinterest show of, I know you are a huge advocate just like I am of Pinterest, which of course there's still so much a dot understanding I think around pinterest power to drive social traffic, um, but also be able to do exactly what Mike is talking about, serving up the exact right content to the exact right audience. Maybe give us a little bit of the behind the scenes into your process. Jeff Sieh: Yeah. Well here's, and I want to just what Mike said is, you know, how important it is to know your audience and serve them up the right information, but it also, you can even drill down even more. And once again, because I love it so much, just talking about visual marketing, it depends. It also depends on what channel you're putting that content out. I mean, as much as we would love to be able to make one piece of content and put it up to all the different channels and have it work just great, that's not what happens. Everything is optimized differently. And so I learned this fact when I was doing some research for a client, it was a big client, like macy's, it wasn't macy's, but it was when I was looking at their stuff and Nordstrom's trying to, trying to kind of get some statistics and figure out what was working. Jeff Sieh: And I noticed on instagram they were showing their catalog of their images and it was the ladies there, you know, the model shots of them in, in the, in the sweater. And it was perfectly instagram. Where are they And then I noticed that same account, that same brand over on had the exact same image, but it was cut off, their head was cut off and you just saw the, uh, the sweater, it was the same shot. They just edited it that way. And I was like, why are they doing that And come to find out when I drilled down to it is people go to instagram and pinterest and for totally different reasons, pinterest is a place where they go to dream and to be inspired. And those images were working there because they didn't want to see somebody else's face on that sweater. They wanted to visualize themselves in that sweater, which the peep that brand had learned that they were getting more click throughs if they cut off the head. Jeff Sieh: So being able to understand, yes your audience, like what Mike was saying, but what type of images work the best for what platform you're driving traffic from. It can make a huge difference if you're trying to sell a product or optimizing, you know, getting them the right content they need when they land on your website. So it's fascinating and I think to answer your question, but anyway, that's one of the things is to drill down and really see why it can't work at instagram is a selfie capital world. Everyone wants to see that, but that image didn't work when they just try to do it to pinterest. So they made adjustments and made it work. Rebekah Radice: Yeah. Yeah. No, it really incredibly important points about not just understanding your audience but the platform and the reason that they're coming to the platform, um, and their actual personal usage. And that leads us into Janelle's question, which is how do you track your instagram traffic Maybe talk about social media examiner and you guys, I have a very heavy presence on instagram, how you're using that and then how you're tracking how effective that channel is for you. Jeff Sieh: Yeah. So instagram for us is all about engagement. I don't know a lot of people. I mean some of the people can really sell well off of instagram. Once again you want to look at what's going to work the best for your platform and your product and your audience. We use it for engagement. It's really great for us to talk to people and I've even found out like some like high influencers or whatever, they're more likely to respond to me on instagram if I have a question then if I would just like ping them on facebook. So that's, it just seems like it's a better place to interact and have engagement. So that's what we use it for. It is really hard to track traffic on instagram if you, because you only have that one link in the bio unless you have the, you know, the swipe up and some of the other stuff. Jeff Sieh: But for the small, smaller businesses, the only way to really track it, and I learned this from my friend Jen Herman is, you know, use a, a pretty link or a bitly link where you can actually track traffic that way and still have it look good off of instagram. And that's what we do. And so the funny thing is, is if those people land on your profile and actually go to your profile and click on that link, that is really qualified traffic because they have gone that distance to do that. And we've actually made sales to are pretty expensive. A big ticket item for the conference right from the profile page on instagram because once again they get the know, like, and trust factor and once they're there they really want to be there. And so, um, keep that in mind when you're trying to, um, you know, optimize your, your instagram profile is that third there Man, they, they really like your stuff. Rebekah Radice: Yeah, yeah, yeah, yeah. No, totally. A great point. And Stephanie talked to us about your use of instagram and a to that person that is saying a lot of what Jeff just said, you know, it's, it's just an awareness channel. They're really struggling to sell anything. I'm off of instagram. What, what would you say to that person that's really pushed them back Oh Gosh. Um, you know, when I use instagram I use it again to get to really, really know what's going on with my audience. So I use a lot of stories. I'll use the ask a question feature and I'm like, Hey, what What are you afraid about using about live video I'll ask them open ended questions, like if you did jump on live video, what type of opportunities would that open up for you And then they just start telling me what they're thinking and their thoughts are. Rebekah Radice: And again, I'm still using that as a part of my sales copy or my Faq. What's really nice is that anyone that engages with my instagram right in facebook, I can go ahead and create a custom audience of people that engaged with my facebook business profile. So then now if I know that they reacted to a certain post about like mindset, I could go ahead and retarget them on facebook with five things that you should now on how to instantly become confident on camera. I know that that's going to go ahead and work and I could split test that with everything that I'm doing. Rebekah Radice: Yeah. And you know, I was going to go back to Janelle's a original question about, um, instagram analytics. She also wanted to know if you favor it just simply the native analytics within instagram or Google. I have a feeling I know your answer just for our conversation here today, but your thoughts. I mean, I like looking at how my audience breaks down on instagram gets. I'll get that there. Um, but he also liked to take a look at it like Google analytics to see what type of content they're consuming. I'm also interested to know once they hit that one page, are they looking at other content because then that gives me an idea of what I could go ahead and share behind the scenes on instagram. So it's a mix between the two. Honestly. I mean one will give you more information than the other. Rebekah Radice: It really depends on how you want to slice and dice it. It really does. Depending on what you're looking for because just looking within your analytics, say within instagram you can learn so much about what content people are already engaging with. What's been your top performing content What are those stories that people are actually paying attention to And then how can you create more of, um, so yeah, it definitely does. Janell depend on what you're looking to track. But the great news is, is there's so much data out there are, there is so much information that really helps us see that our audience is out there raising their hand saying this is what I want from you. And all we have to do is listen and then respond. Yeah, exactly. And Mike, you are in my opinion, the king of repurposed thing and as we talk about, yes, most definitely we bough a as we talk about social referral traffic and how to get that to convert. What I love about re purposing is we aren't reinventing over and over and over, so we're. We're talking about facebook and instagram and pinterest and it can feel terribly overwhelming to think about how much content we have to create. Gives. Give us some of your tips on how we can take that one piece of content, turn it into multiple pieces of content and really use that to drive traffic. Mike Allton: Yeah. This is something to definitely talk about all the time because I like starting with her favorite medium, which is a live video. Now, full disclosure, that's not necessarily what I do all the time because I love to write, so I start with the blog post, but for everybody else, particularly if you don't like to ride, start with a live video to facebook specifically because there are so many wonderful things that will happen just by broadcasting live to facebook. But once that broadcast ends, now you've got a video and let's say you brought on a guest and let's say you talked to that guest for 45 to 60 minutes. An hour's worth of video content is approximately 10,000 words written down. So you can take that one hour video and turn it into a blog post and there are services you can use rev.com or a it designer.com, uh, that, that stuff has been using. Mike Allton: That is really fantastic for taking that transcript and turning it into a blog post. And then you can add some additional information and intro and outro. And now you have quite frankly an epic piece of content that you can publish to your blog. But you don't have to stop there. You can take that piece of content and you can turn it into a slide share presentation and maybe that sounds like a lot of work, but it's not all you need are two sides, a beginning intro slide and an end slide, and in the middle of that slide you can take that facebook video and upload it to Youtube and now you can embed that youtube video in the middle of that slide show. So now you have a slideshare presentation. This really just your video housed between a couple of slides that didn't take you but 10 minutes to to create and you can put a link to the blog post or a link to the youtube video or a link to the facebook video. Mike Allton: Because we want square videos if we're going to do the instagram feed, but we also want top videos if we're going to do stories. So you can take that single facebook video, maybe just a snippet of it where like, you know, somebody is talking to your guests is talking nice to shine the spotlight on them. Take just their head in a tall format in a portrait format and upload that to instagram and facebook as story content. And while you're on headliner, take the audio and make an audio. Graham, which is just a video basically, but now you've got a graphic and you've got subtitles captions and you're using, again, just a snippet of their texts, but wait, there's more audio and turn it into a podcast show. If you do a series of these, you don't want to just one, but if you do a series of these and maybe you're going through Stephanie's mastermind where you or she's teaching you how to do a facebook live show, you can take each one of those shows and strip out the audio at an intro and an outro and maybe a bumper in the middle and upload those to itunes. Mike Allton: It's super easy to sign up for Libsyn account. Rebecca, I know you do this and you upload that edited, finished audio product to Libsyn and it pushes it out to Google play and stitcher and Itunes, and now you've got a podcast and you're reaching millions of people potentially with that one piece of content. Rebekah Radice: Yeah. Brilliant. And I, I, I'll give you one other little tip on that too. That is so it's, it seems tacky, but it's so easy. So you've got your video and you want to transcribe that video because you've got those 10,000 words you're talking about. I love the tool anchor dot FM, which will turn your audio into a transcript and then into a video visual so you can just export audio only out of your video, uploaded into anchor dot FM. It will transcribe that entire thing for you. My team grabs that, drops that into a doc, and then we can just manipulate that a little bit so it actually looks decent, um, and turn that into a variety of pieces of content. Everything from social post or blog. So yeah, really the sky is the limit with the that are out there and available to us. Jeff Sieh: to. Mike said, you know, that's how I got my Gig at social media examiner is that I would on back in the day the Google hangout shows and Mike was actually one of my. He was the on the manly pinterest tips show back in the Google plus hangout days and I from the get go has repurposed that as a podcast and that's what got me in with social examiners that I had a podcast and I have this show that I was doing and so we always are trying to crank out content so much and I think Mike and your point, Rebecca, is to step back and actually squeeze every last drop of content we can out of the content we made before we move onto the next thing because we're just really getting the most out of it. We can now to your point about Pinterest, the thing that's exciting about it for me the most right now is the. Rebekah Radice: yeah. Well, I, I think the, the point here is why, why constantly go back and reinvent when you can learn, you can learn from your users or from, uh, your customers exactly what they're looking for and you can do what you're doing is Stephanie, which is just re purposing out all of that video. Tell us a little bit about how you are using your videos. Oh my gosh. Okay. Are you guys ready for this Because I'm about to like geek out with you. I'm going to tell you like my favorite tools. There's this complete system that I'm, that I'm sharing with my crew, but. Oh, I want to roll up my sleeves. We're ready. We're ready. We're gonna. There's this website called repurpose.io, and here's what happens. You guys, if you wanted to, if you went live on facebook, repurpose.io will automatically take that live video and upload it over to Youtube. Rebekah Radice: If you want it. You could have an intro and an outro automatically added to that youtube video already done my repurpose.io. The other cool thing that we purposed that io will do is that'll take that live video and save it into a dropbox. Cool, right. The next tool that is that I have is called designer.io. It's D, e z or no, d, e, s I, g n R, r that Io. They always like to spell it. Funky. Go fake. Okay, so designer.io. Once they know rebecca that you have a video in dropbox, it'll automatically take that video, create a transcript so you have your blog post. It'll create an srt file, which you can go ahead and optimize your videos on both facebook and on Youtube. Right, and then if you wanted to, you could take that transcript, turned it into an Ebook or a pdf. Rebekah Radice: If you want to go ahead and start selling your books on Amazon kindle, you absolutely can, right And then we'll go ahead and actually take the image that you created and turn it and mock it up into like a three d book. Whether it's a hardback or a paperback, so there's this whole system. You go live once and boom, it automatically does it for you. It's insane. It's bananas. Well, and what I love about both of those tools is they are very low tech. You do not have to be a designer to use those. You don't have to have a background in graphic design. You don't have to spend a ton of time. Oh my gosh, I just think of the amount of time we have spent in the past creating these beautiful ebooks or pdfs or you know, downloads, whatever they were in the day were these, both of these programs and just make it so incredibly simple. Rebekah Radice: Well, Mike already stole my other answer. Headliner don APP, which I absolutely love. Anchor is now something that I want to test out. Visual content. I'm the one that I've been playing around with and this stems from my interview with Jeff was I wanted to use a program called Flixel, which will make those cinema graphs. So back to what he was saying about like the Harry Potter thing, but it's like a still image, but then let's say it's me holding a pdf. I'm staying still, but the pdf pages are just like flipping and that's, that's something that um, I wanted to test out on pinterest because I think it will stand out from everything else that's out there. Yeah, definitely catch your eye, that's for sure. Jeff Sieh: And you can upload those if that would be an animated Gif and those work, those play as well automatically on pinterest. Jeff Sieh: So you know, everybody, I'm one of the things on visual marketing is, okay, how do we create images easily and not have to be a photoshop nerd I'm a photoshop nerd so I love using it. But you mentioned spark, which is a great one to use canvas. Great. Everybody hits it really hard though. I mean they're a great service. It can create some great graphics, but a lot times I'll be going through pinterest and I can scroll through the feed and go, oh, there's a canva pin. Oh, there's another canvas. And so what I always recommend for people who are trying to create images quickly is there's a way on canva you can open up to different pages and so drag a design that you like, a typical, you'd like to one and do another one that you like to another one and then swept up the fonts. Jeff Sieh: Right And you can also, the biggest thing, and this goes back to what we've been talking about before, is your audience. If you notice your audience's pinning something to a certain board and continually doing stuff, I'm going to quote peg fitzpatrick, you know, how do you feed that content monster And so getting that kind of analytics, whatever, you know, if you're doing it with Google or with whatever software tool like tailwind, if you can see where your audiences, you know, you know, if they're putting a lot of stuff on my woodworking board or on my pinterest tips sport, I'm like, okay, I need to make more content that fits in that because that's what they're wanting right now. And a lot of times it'll be seasonally, especially on pinterest and being able to dial into what's working is super important. Rebekah Radice: I, you know, I'm going to ask you one quick question before we move on to Mike and his tool suggestions. You talk about seasonality and that is incredibly important when we're thinking about social conversions and really understanding what seasons, what dates, um, but uh, what events are important to your audience And I think pinterest gives us a very unique way to share those. Jeff Sieh: Should we not use it And so they were, the whole consciousness was getting behind that piece of news. And Mike, I think you even have a great article about how to do that on your site and it's some great ideas if you can, if you can see what's coming like, you know, even if it's in the national, whatever friend day or, you know, clean up. We did want it. So she makes. I was like, Nah, national, it was national, clean out your desk day or clean up your desk day. And so we took a picture of Mike Stelzner's desk with all his cans on it and it was funny and it worked and it was, it tied into that consciousness. But that's another great thing you can do with any channel. Rebekah Radice: Yeah. Uh, it make me think of just so many different days. National Chocolate Day and wind day. I will celebrate all the day. Rebekah Radice: yes. So Mike, I have a sneaking suspicion I know what your favorite social media scheduler it's going to be. Um, but yeah, I know big secret, but yeah, give us some more of your favorite tools. Mike Allton: Yeah, I've got some great tools and, and thanks jeff for giving me the shout out about news jacking. I gotTa admit I didn't invent that term. That was my friend David Meerman, Scott and I was so tickled to see him post on instagram the other day that the term newsjacking was a jeopardy question. So just imagine that you invented the word and a jeopardy question now. He was so thrilled with that. I was happy for him. Uh, but yeah, I love that technique. I definitely can share resources that people wouldn't know how to use that, but when it comes to tools, yeah, my favorite tools at Gore, Paul's, that was, that was the easy answer. I also use tailwind, which we mentioned, uh, because tillman is fantastic for pinterest and a girl pulse supports all the other networks. But here's the thing, Diana, for you and for anyone else's wondering, what tools should I use, what we use as great buds that may not be the best tool for you. Mike Allton: So first you want to think about how social profiles are you actually using Many of the networks like facebook, they've got scheduling built in and so if you're only focused on one network, you don't need a high end tool. You don't need a gore balls. You could use the native. We're native network. If it has that capability or a simple tool like a buffer, which is great. It's only when you begin to add multiple profiles that you want to add a tool and almost kind of disconnect yourself a little bit from the network because when you're using a tool that's great, but it's less likely you're going to be as involved in that network. So I still spend a lot of time on facebook. I still spent a lot of time on twitter manually tweeting back and answering questions and replying to people. Even though I can see a lot of the data and I can schedule the activity in a gore. Paul's being in the weeds in the trenches is so good for your personal understanding of what's going on and your brand presence. So to answer the question, Girl Paulson tail one of the two big tools that I use. I also use sem rush for the social, which is pretty cool because they have some great competitive analysis. I can see how I'm doing. I can benchmark my activity across multiple networks against multiple competitors. Uh, and that's a really insightful piece of information. Mike Allton: I am the Blogging Brute . So w and blogging brute everywhere. Rebekah Radice: Excellent. Stephanie, how about you? Stephanie Liu: You can find me at LightsCameraLive.com. Jeff Sieh: And Jeff, I'm jeff. See across the Internet webs I before e especially in c and I'm always@manlypinteresttips.com where we're adding testosterone one pin at a time. Alright and I will ask each of you a favor because you dropped so many amazing tools. If you would, uh, you know, maybe pop into the chat, give a gift. Kate, all of those different tools so we can get those out to everybody. I'm sure they were frantically trying to write them down, so if we could get those two down to that would be terrific. But uh, thank you again to our panel. You guys just shared so much amazing information and thank you to everybody that showed up your live. Everybody that is watching the replay. Make sure to join us for our next sem rush. Social Chat. It is on March fifth. Cut Grief. How are we already moving into March It's crazy. We're going to be talking a seo and social media, the state of organic traffic in 2019 mark trap Magen David Amaryllis and many of us will be a nice idea. Just another amazing panel I get to hang out with you. Super Smart Aids. I am Rebecca reduced. Thank you again so much for joining us. We'll see you back here next time.